Continuing Education, Inc. is accredited by the Accreditation Council for Continuing Medical Education to provide continuing medical education for physicians. Continuing Education, Inc. designates this live activity for a maximum of 14 AMA PRA Category 1 Credits™. Each physician should claim only the credit commensurate with the extent of their participation in the activity. This program is eligible for Category 2 credit with the American Osteopathic Association (AOA) . This activity is eligible for Section 1 credits in the Royal College’s Maintenance of Certification (MOC) Program . Participants must log into MAINPORT to claim this activity. Please let us know if you require AAFP Prescribed Credits. AAPA accepts certificates of participation for educational activities certified for AMA PRA Category 1 Credit™ from organizations accredited by ACCME. can claim either ANCC Contact Hours or AMA PRA Category 1 Credits™ as needed. 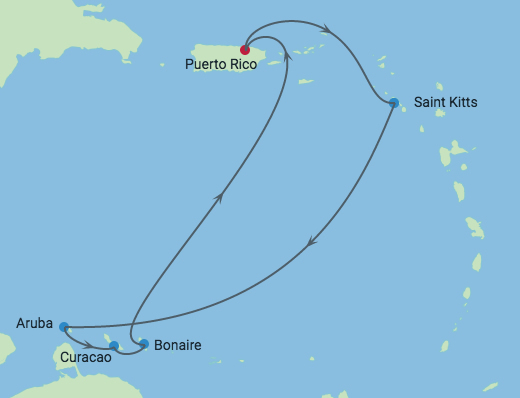 San Juan, Puerto Rico (Embark and Debark) – In days of yore, the waters near Puerto Rico teemed with pirate ships commanded by the likes of Sir Francis Drake. Aye, they are long gone, but in their wake they have left an island of national treasures: La Casa Blanca, built in 1501 for the island’s first governor, Ponce de Leon; the cobblestone streets of Old San Juan; the tropical rain forests of El Yunque. Basseterre, St. Kitts – The island England zealously defended from Brimstone Hill, the “Gibraltar of the West Indies.” In Basseterre, a mini-London, there’s Piccadilly Circus to shop and a gingerbread version of Big Ben by which to check the hour. Kralendijk (Bonaire), Antilles – Kralendijk is the sleepy capital of Bonaire, an island in the Dutch Antilles. Kralendijk is lined with delightfully pastel stucco houses, in pinks, oranges and lime greens. Famous for its diving – the island is surrounded by a Marine Park – Bonaire also offers such treats as flamingos, hiking and the only barefoot casino in the Caribbean.